THANK YOU, Live Wire listeners, for helping us blow past our first goal of $10,000. Once we combine donations to our website with Give!Guide, we're pretty sure we met our NEW goal of $15,000! Your generosity is humbling and inspiring. Huge thanks for your faith in us, and a happy, healthy new year to all. If you happen to see any of these donors who won fancy-pants gifts during the campaign, please give them a congratulatory pat on the back and resist the urge mug them for their winnings. We discourage mugging. Hotel DeLuxe "Best Date Ever" Package: Esther F.
Dinner on stage for 2: Kerri T.
Underwood Typewriter from Vintage Pink: Linda M.
Velvet Painting by Juanita: Karen E.
Natalie Portman Painting by Scott Poole: Brian G.
Sean McGrath's VHS Collection: Stephanie S.
KISS Christmas Lights from Ryka: Tony F.
Mississippi Studios New Year's Eve Package: Karen D.
Toro Bravo Gift Card: Laura A.
Tasty n Sons Gift Card: Paul F.
Interurban Gift Card: Andrew B. We'd also like to give a BIG THANK YOU to our Give!Guide business partner, Java Jacket, for matching $2000! by Trent Finlay on January 6, 2012 - 1:46pm. You could win this velvet painting, Pink Cosmo, by Juanita (aka Jennifer Kenworth) by donating any amount to Live Wire this week (December 26-31) through Willamette Week's Give!Guide. Juanita has been creating velvet paintings for over 10 years, focusing her subject matter on icons and objects of American pop culture. Her work has been recognized on several television shows, including the Tonight Show, HBO and OPB’s Oregon Art Beat. For the Give!Guide, Juanita is thrilled to donate her velvet painting of a cocktail for Live Wire, as she is a huge fan of the show and an active volunteer. She has been around since the beginning and is also the person responsible for the velvet props and sparkly things that you see on stage. Juanita's Velvet Crying Conan, commisioned by Voodoo Doughnut, was featured in the Museum of Conan Art (COCOMoCA). Watch the CNN video here. by Trent Finlay on December 27, 2011 - 12:00am. by Courtenay on December 20, 2011 - 5:50pm. We are entering a friendly competition with PHAME Academy to see who can reach $10,000 first in the Willamette Week Give!Guide. Stephen Marc Beaudoin (ED, PHAME Academy) or Courtenay Hameister (Host of Live Wire) have to don a funny lookin' costume (like a banana suit), go to Pioneer Courthouse square and sing a song extolling the virtues of the winning organization, which will be videotaped and spread online. The next $1000 will be matched dollar-for-dollar by our Board of Directors. Give ANY AMOUNT and you're entered to win THE BEST DATE EVER at Hotel DeLuxe with dinner at Branch and two tickets to a Live Wire taping. Give $50 or more will be entered to win dinner onstage for two DURING A LIVE WIRE TAPING, complete with on-air check-ins! Give $100 or more, get your name in a Live Wire sketch. Give $1000 or more and receive two Live Wire season tickets, two drinks at Branch, and your name in a sketch. The first person to donate $750 will receive a poem-a-gram delivered to their house by none other than our House Poet, Scott Poole. The first person to donate $1500 will receive a Live Wire Unplugged performance in their living room. BECAUSE IF LIVE WIRE WINS, STEPHEN MARC BEAUDOIN WILL DON A RIDICULOUS COSTUME AND SING IN PUBLIC. AND ON VIDEO. AND IN OUR HEARTS. by Trent Finlay on December 16, 2011 - 4:41pm. Live Wire House Poet Scott Poole is donating this Natalie Portman painting THAT HE PAINTED to one lucky winner who donates ANY AMOUNT to Live Wire in the Willamette Week Give!Guide this week (Dec 19-25). "This is my first attempt at a portrait in oils. It's based on a Vanity Fair photograph of Natalie Portman. I just needed something to paint. Now I think it's time for Natalie to go off and do some good in the world. I think this is an essential item for those who are a Star Wars and Live Wire fan." Natalie Portman is an actress best known for her work in such films as Leon: The Professional, Black Swan, Hesher and Star Wars: The Crappy Ones. by Trent Finlay on December 13, 2011 - 10:16pm. Donate any amount to Live Wire in the Willamette Week Give!Guide this week and you'll be entered to win a $50 gift card to Bar Bar and a pair of tickets to Mississippi Studios' NOT-TO-MISS ROOF RAZING NEW YEARS EVE SPECTACULAR QUADRUPLE LINE-UP with Nurses, Radiation City, Wild Ones and DJ Beyonda. 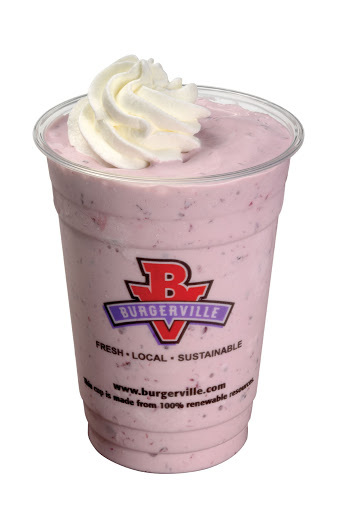 In addition, the first 14 donors will receive a free milkshake from Burgerville. YUM. by Trent Finlay on December 13, 2011 - 12:53am. Our friends at the Creative Advocacy Network (CAN) have a TREMENDOUS opportunity. If CAN gets 2500 twitter followers before the New Year, the City of Portland will award them with $75,000 of arts funding. As of today, CAN is less than 500 followers away. We are donating a pair of Live Wire tickets to be given away by CAN through Twitter on Saturday, December 17th. CAN will announce the winner via direct message on Twitter. They've got a TON of other incentives throughout the month and NO LIMIT on how many times you can enter! The Creative Advocacy Network (CAN) is a 501(c)3 organization established to mobilize the Portland Metropolitan Region in support of a dedicated public fund for the arts, to increase access to arts and culture for every resident, make free arts and music experiences available to every school-age child in their classrooms and communities and strengthen our highest-quality arts and cultural institutions allowing Portland to finally reach our true creative and cultural capacity. by Trent Finlay on December 13, 2011 - 12:05am. Give ANY AMOUNT to Live Wire in the Willamette Week Give!Guide by December 31st and you will be entered to win a night for two at Hotel DeLuxe, dinner for two at Branch and two tickets to a Live Wire taping. Eeeeesnotsobad, eh? Click here to donate now in the Give!Guide. $50 - Enter to win a romantic dinner for two on the Live Wire stage, complete with on-air check-ins! $100 - Get your name in a sketch. by Trent Finlay on December 6, 2011 - 5:58pm. Donate to Live Wire in the Give!Guide this week, and you'll be entered to win a prize Hemingway would enjoy. Is it a bottle of scotch and an economy with language? NO! It's a 1947 Underwood Universal Portable Typewriter, donated by our wonderful business partner this week, Vintage Pink on Hawthorne. The Underwood was one of the most popular modern typewriters, used by writers like Hitchcock, Kerouac, Faulkner and Hemingway. You can find this baby online for anywhere from $200-$500, but if you donate any amount to Live Wire through the Willamette Week Give!Guide you'll eligible to win it at the end of this week. Gosh, what a deal. by Trent Finlay on November 28, 2011 - 4:45pm. On Thursday, October 20th we had our very first benefit event presented by Rejuvenation - held at their beautiful store on SE Grand. Being a first for us, we had no idea what to expect and were absolutely touched at having the support of 200 people, raising nearly $14,000! Live Wire host Courtenay Hameister was the ringleader for this mini Live Wire show with live performances by the Parson Red Heads, Oregon Ballet Theater's Uprising, featuring musical guest Weinland, Hand2Mouth Theater and Live Wire house poet, Scott Poole, who read from his original work (that was just featured on Garrison Keillor's Writer's Almanac). Also, Congressman Earl Blumenauer made a special appearance to talk about the importance of the arts to build community and the unique impact of Live Wire! Radio on the Pacific Northwest. All performers donated their time to help us raise money and we are truly grateful to them for sharing their ample talents with us. A HUGE thank you to Rejuvenation for hosting this event, Dig A Pony for providing delicious appetizers and the specialty “Live Wire” cocktail, New Belgium for providing beer, Argyle for providing the bubbly, and St. Cupcake for providing sweet treats. Also, 30 businesses we love donated items for our silent and live auction. And most importantly, to YOU. Your support is so humbling. After seven years, we keep feeling the love from the community and that means everything. If you didn’t get to attend the event, but love Live Wire! Radio and want to help, please click here. Click here to see pictures from the event by Jennie Baker Photography. by Trent Finlay on November 22, 2011 - 7:46pm.